What is it about Spring that gets us cleaning? It seems the thought of flowers blooming and warmer weather has us rushing to clear house and garage clutter. So what about our wardrobes? Who of you out there are just as diligent with a wardrobe clean? Stylist or not, I do this each season and recommend it to everyone. 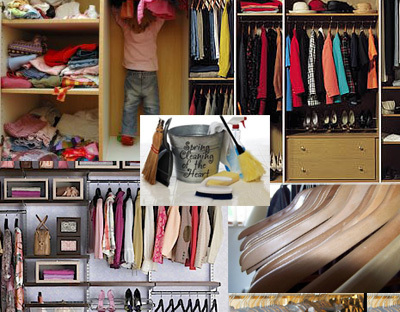 I organize via season followed by colour as these two factors are important to my dress choice. Below are the rules according to Style with Cindy but remember, it needs to work for you so make your own rules. 1. If you haven’t worn it in two years, consider donating it to a charity or friend, selling it on eBay or binning it. I know many of us may hold onto pieces for sentimental value but these pieces are better packed away and labelled rather than floating aimlessly in your wardrobe never to be worn. 2. Next I sort by season which is why I also clean quarterly. I like to prepare for the weather and trend changes to come. So pack knits, jackets and warm fabric items together whilst the flowing dresses, tees and summer/breathable fabric items are together. 3. Finally I recommend sorting by colour. This may seem extreme to some but I believe it works. Colour selection is essential to your dress choices and ensuring it is complimenting to you and as you continue your style journey it’s much easier to put outfits together when they’re sorted. Depending on your lifestyle, I recommend a corporate/work section and evening section for your more delicate pieces. Jeans and pants work also well together. Accessories should be stored separately in drawers or a box (tangled necklaces are a timely waste! ), shoes should be in boxes with photos or where you can see them and should become part of your weekly dusting routine whilst hang scarves to avoid excessive creasing. My best advice is to try not see this process as a chore but more so a cleansing process as we do to our homes and bodies. You will see that you will find things quicker, including beloved pieces you forgot about along the way with those which may have you wondering what were you thinking at the time of purchase!